Messages can be written and viewed in HTML format, the latter only if there is an HTML format section in the message. If a message in HTML format is received, then there is a global setting for each User under Preferences - HTML to automatically display it in Plain Text format. If this is not checked, the message will be displayed in HTML format. However, each folder can also be set to override this global setting and to display the HTML or TEXT sections under Folder Properties - Send/HTML . Whatever mode of display you use, you can always use the context menu (right-click in the body of the message) to switch between the two. If html format messages do not display properly in MailCOPA, then Show message in browser should be used from the Context Menu. There are some potential security risks in viewing messages in HTML format - images downloaded which can be used to show to the sender that the message was viewed. There are settings to prevent these actions under Preferences - HTML . There are global settings for each User for composing and replying in Plain Text or HTML, under Preferences - Editing . However, there are also individual settings for each folder under Folder Properties. 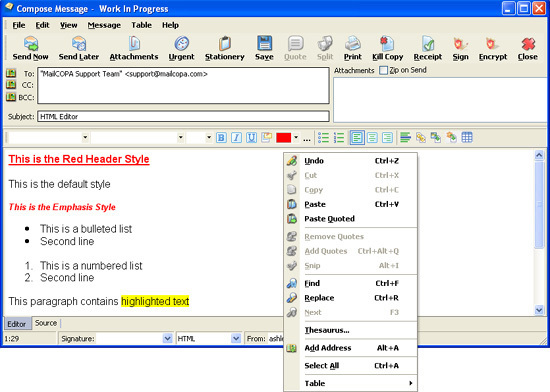 It is also possible to change between Plain Text and HTML formats during the composition of a message, using the list box at the bottom of the editor. 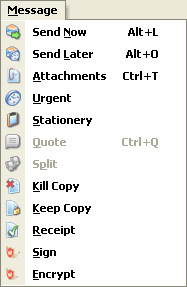 In addition to the controls visible in the editor, there is also a Context Menu, available by right-clicking the mouse in the body of the message, as shown below. The Message Menu is slightly different to that shown in the Main Window. In HTML mode, it is possible to view and edit the source code - click on the Source tab.